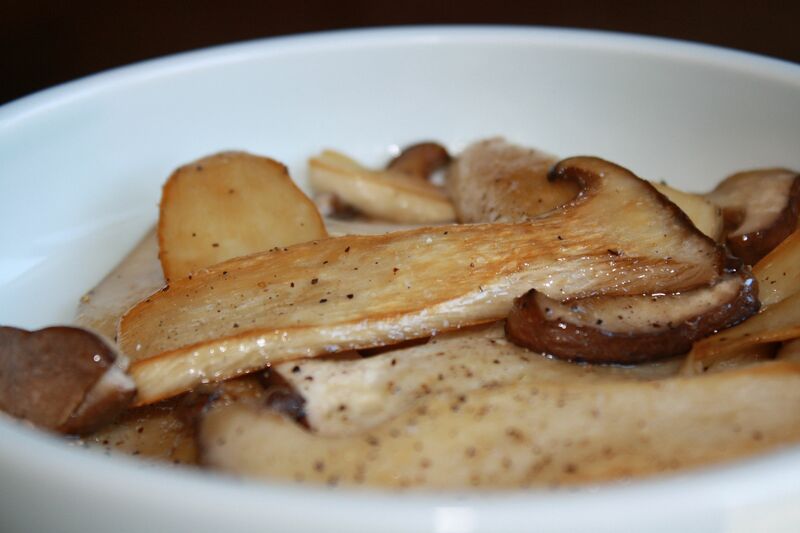 Songyi- busut (Pine mushroom) is one of the most loved and expensive mushrooms in Korea, and is said to be very healthy because they absorb the scent of pine trees in the mountains. There is an old saying that “Even a father and son will not share the location of the songyi-busut“! Although the songyi-busut that are naturally found in the woods are very expensive and not really sold in everyday grocery stores, people get sesongyi-busut (which literally means, “new” pine mushrooms = King oyster mushrooms) and cook it the way we cook songyi-busut. The first time I had sesongyi-guyi, I was very impressed. It was excellent. It is a super easy dish that you can whip up for a quick banchan, snack, or even a main dish if you have enough mushrooms and are feeling particularly lazy. 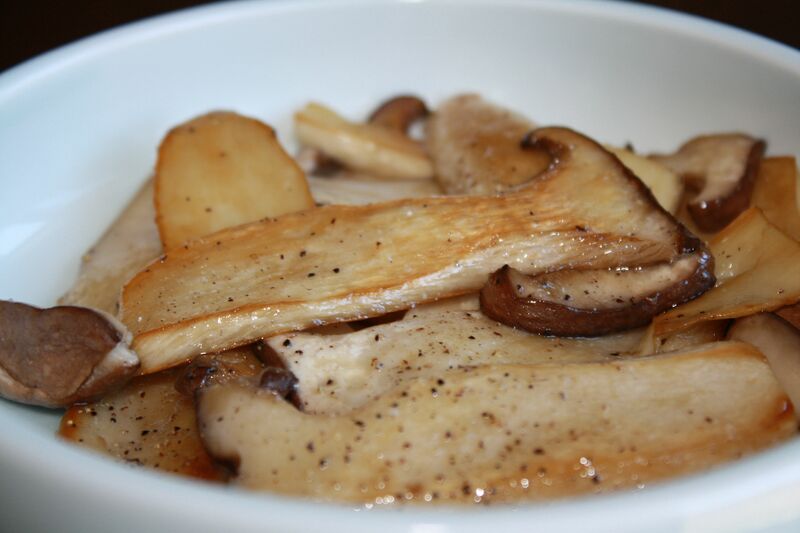 The king oyster mushrooms are denser and chewier than most and have a really nice, yummy flavor. Seriously. It’s good. Try it! 1. Cut off the bottom of each mushroom. Slice the mushrooms vertically into quarter inch slices. 2. 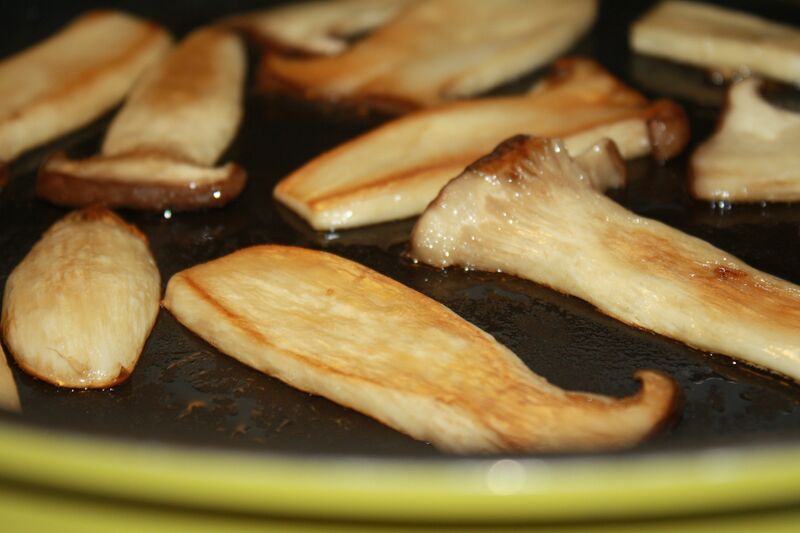 Cook the mushrooms over medium-high heat, flat on the pan so they are not overlapping. 3. Turn the mushrooms over so that each side is browned and a bit chewy/crispy. You can add a very tiny splash of water, cover lid, and cook for a minute if you want it soft and chewy. 4. Grind sea salt and pepper over the mushrooms to taste. How easy is that? And so good! 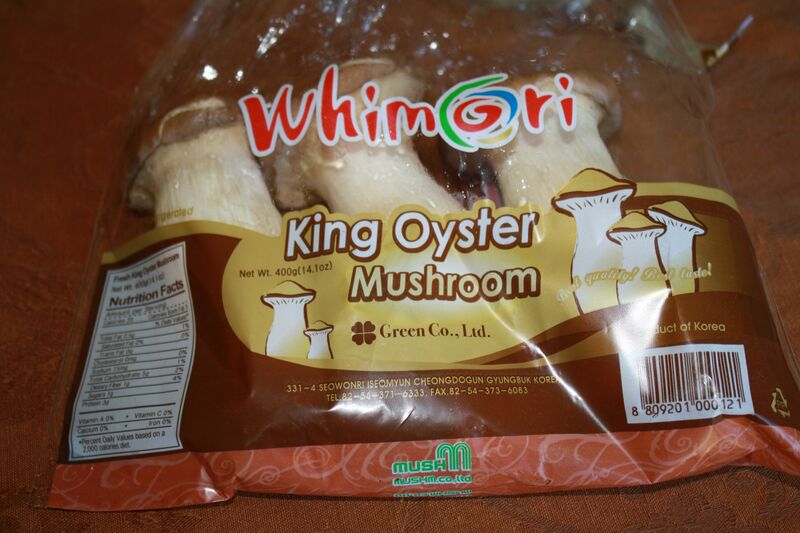 You will likely only find the mushrooms in a Korean or other Asian grocery store. They are called by a couple of different names on packages, but they’re easy to recognize. 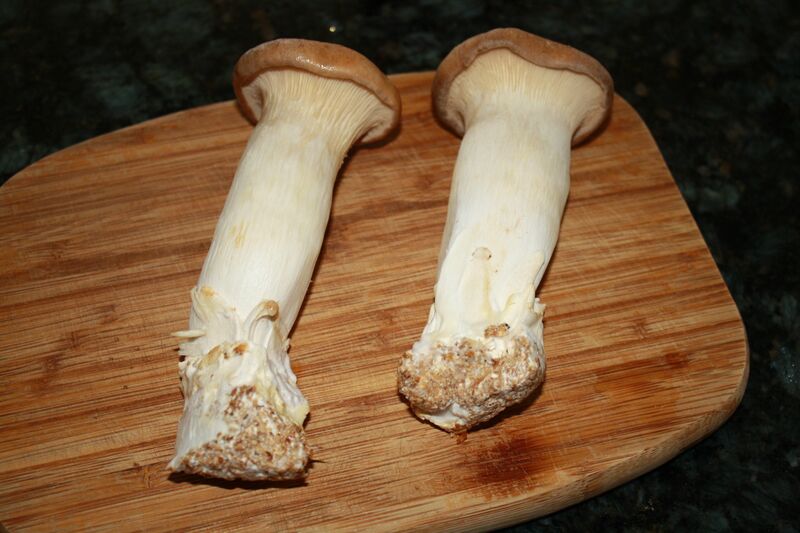 Slice off the bottom of each mushroom and then cut them into quarter-inch slices. Chopsticks are our weapon of choice for flipping the mushrooms Keep in mind that the mushrooms will get smaller as they cook. You want to be sure to have enough oil to keep them moist and for them to brown relatively quickly, so add more if necessary. If you don’t, they’ll really shrink down. Eat them while they’re hot! You might put them on a heated plate if it’s cold. Mmmmmmm….. 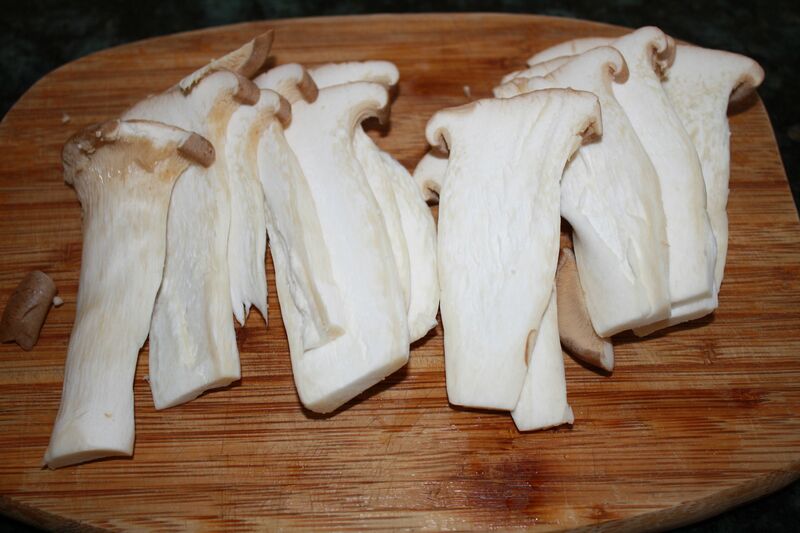 I was looking for a recipe for the these very mushrooms tonight, which I bought at our local co-op in New London. this fits the bill perfectly! I can’t wait to look at some other recipes here. What sort of pan do you prefer to use for this? It looks like a nonstick skillet in the photo? I have a cast iron skillet and a steel wok. BTW, I’ve linked this recipe to the Fiddleheads Food co-op Facebook page. This is a great find, and thank you! Hi, Janice. Thanks for finding us! Our cookware is a ceramic brand from Korea, but really as long as you use enough oil to keep them moist and from sticking (you can add a little water too if you’d like), any pan should be just fine. Hope you enjoy the other recipes and thanks for sharing our site with your co-op friends! Great, hope you enjoyed them! Thanks for finding us! how long do u cook it for? Long enough to brown it. It varies depending on the thickness of the slice, how much salt you put on, etc. 19 Signs You’ve Been Vegan Too Long | シ最愛遲到. !